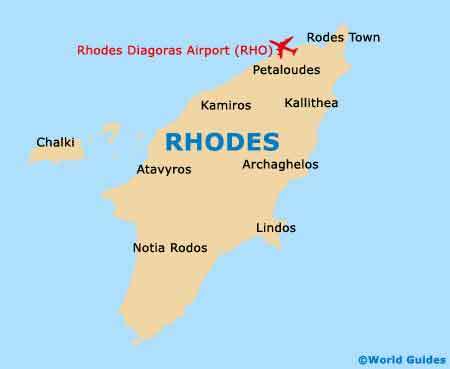 There is no question that Rhodes is a very appealing holiday island, packed with quality attractions and superb beaches. However, many holiday makers find that its proximity to other Greek island attractions makes daily excursions and island hopping by boat extremely tempting. Particularly close to Rhodes are the islands of Halki and Symi, both of which come with their very own sets of attractions and are perfect for day trips. Further afield and yet still within reach of Rhodes is the island Crete, which is steeped in Minoan history, although just a little too far to make a day trip feasible. As the capital of Greece, Athens is more than worthy of a visit and the city can be reached in just 45 minutes from Rhodes, by plane, making a day trip here really quite feasible. 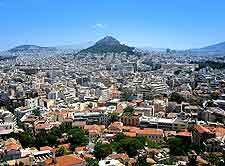 Athens is crowned with so many glorious sights and famous attractions that you will likely be a little overwhelmed. 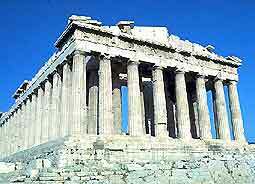 The Acropolis is know across the world and its image is used on my publications and postcards about Athens. Another monument not to miss is the Temple of Olympian Zeus, which dates back some 1,500 years. Do try to leave some time for an excursion to Crete if at all possible, since the Minoan attractions on this beautiful island are really quite special. 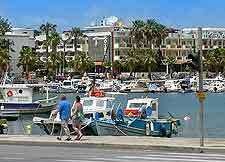 The overall journey to Crete will last upwards of nine or ten hours, depending on whether you choose to arrive at the port of Agios Nikolaos, Heraklion or Sitia. Not to be missed under any circumstance at the remains of the truly ancient Minoan civilisation, which can be found in both Knossos and Phaestos (Phaistos). 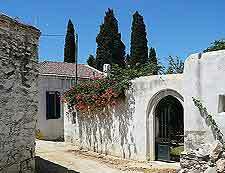 Kos is within easy reach of Rhodes by ferry and it a very popular island in close proximity. 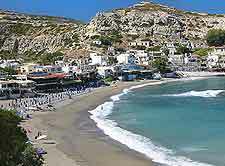 Each year, crowds of tourists come to Kos to stay at one of the island's innumerable resort hotels. The attractions on Kos are extremely varied and include attractive mountain villages, plenty of restaurants and bars, lively nightspots, secluded coves and endless beaches. Those with an interest in history will find that Kos Town is home to some wonderful archaeological remains, which include a Christian basilica from the 5th century, the Shrine of Aphrodite, and the Temple of Hercules. Halki is the smallest of the Dodecanese islands and is especially close to Rhodes, lying just 6 km / 4 miles to the west. Known for its rocky landscape and past sponge fishing industry, the Halki of today is a quite island, where tourists come to relax, with there being very few attractions as such. The remains of the medieval castle of the Knights of St. John may be of interest on Halki, along with the historical frescoes located within the chapel. Surprisingly close to the Turkish border, ferries from Rhodes regularly travel to the port city of Marmaris, a popular destination on the south-western side of Turkey. 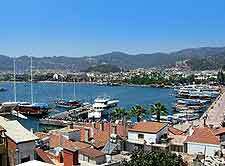 Depending one your mode of transport (either hydrofoil or catamaran boat), the journey to the attractions of Marmaris will take between one and two hours, departing from Mandraki Harbour. Marmaris is a very historical city with an impressive castle, although most day trippers tend to come here for the Turkish baths, jeep safaris through the mountains, the sailing opportunities, and the beautiful beaches, with many restaurants lining the main beachfront promenade. One of the leading day-trip destinations from Rhodes, Symi (pronounced see-me) is really very much a holiday destination in its own right. 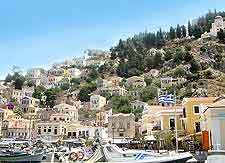 Visitors to Symi will discover a history of both shipbuilding and sponge diving, although today, the island's beaches and fishing villages have become the main draw card, along with its museums and harbourfront restaurants.